In fact, it reminds me of a mix between a Viper Mark VII and Galactica's one stealth one-of-a-kind Viper, also called the Blackbird, in obvious homage to the SR-71. 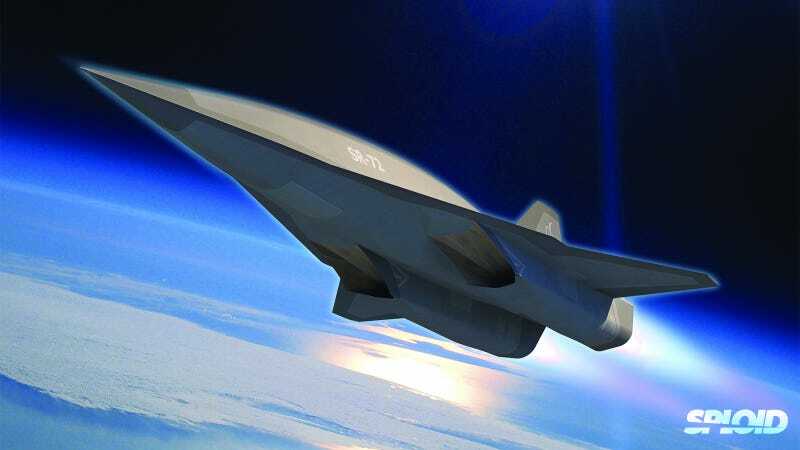 Lockheed Martin's Skunk Works has already begun development on the high altitude SR-72, which will fly at Mach 6—twice the speed of the SR-71—and will be capable of carrying weapons. Unlike the Blackbird, the SR-72 is an armed platform that will be capable of attacking from the edge of space. [It's] an affordable hypersonic intelligence, surveillance and reconnaissance (ISR) and strike platform that could enter development in demonstrator form as soon as 2018. Dubbed the SR-72, the twin-engine aircraft is designed for a Mach 6 cruise, around twice the speed of its forebear, and will have the optional capability to strike targets. Guided by the U.S. Air Force's long-term hypersonic road map, the SR-72 is designed to fill what are perceived by defense planners as growing gaps in coverage of fast-reaction intelligence by the plethora of satellites, subsonic manned and unmanned platforms meant to replace the SR-71. Potentially dangerous and increasingly mobile threats are emerging in areas of denied or contested airspace, in countries with sophisticated air defenses and detailed knowledge of satellite movements.